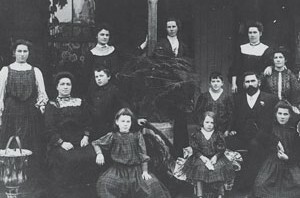 When Mary divorced she worked hard to limit contact between her ex-husband and the children. It was her heartfelt belief that it was not in their best interests to spend extended periods of time with their father. Her ex-husband did not push the issue during the divorce. If he had, Mary had been prepared to fight him. She stayed soft on the child support issues and everything was resolved, not amicably but without a fight. He was to see the children three days every two weeks, and never overnight. The ink was barely dry on the court order when Mary was diagnosed with cancer. Everyone is afraid of dying. Mary was too. She was also afraid that her ex-husband would try to take over full custody of the children and have them live with him in the back room of a beer parlour after she died. What could she do? There are a series of steps that Mary, or others in her situation, might consider. First of all, she needs to have a will. That will needs to include a clause appointing a “testamentary guardian.” That is a person she designates as being the best substitute parent for the children if she passes away. Mary picked her sister, Jane. That type of designation is not binding. Jane still needs to step forward to the courts after Mary’s death and seek a formal order of guardianship over the children. The fact that Mary picked Jane does not end the matter, and her ex-husband is free to contest the guardianship application. What else can she do? Some parents include a “war-chest clause” in their will. It is a provision that authorizes the testamentary guardian to hire a lawyer to fight the guardianship as a contest in the courts, and provides that the estate is to pay all of the legal fees incurred. Lawyers are expensive, particularly experienced ones. The idea is to ensure that Jane has all of the legal horsepower money can buy in her bid to successfully secure guardianship of the children. It is also possible to prepare a letter for Jane to be opened only if the fight over guardianship does in fact occur. That letter contains a description of all of the reasons why the father might be a bad or dangerous influence over the children. It also leads Jane to the evidence that is available on each point. It gives the names, addresses, and telephone number of witnesses who can testify, if need arises, in substantiating Mary’s concerns about her ex-husband. The letter may not be admissible in court. The idea is not to give testimony from the grave, but to give Jane ammunition to use in the court case. If Mary’s concerns run deep enough, she can take an additional step. She can have a lawyer draft a statutory declaration in which she states all of her concerns under oath in writing, sworn before a commissioner for oaths or notary public. A court is more likely to allow a statutory declaration to go into evidence but there is still no guarantee. Mary’s ability to give evidence likely ends when she does. Most of these measures are put to paper in documents outside of the will. The will becomes a public document. There is no need to embarrass the ex-husband, unless he actually contests the guardianship application. The children do not need to have their mother wash dirty laundry in a document that will be given to them when they attain the age of majority. These are also steps not to be taken lightly. A legacy of litigation can poison children as surely as lead. At the same time, some parents, like Mary, genuinely believe the possibility of protracted litigation is the lesser of two evils. They cautiously and carefully build the protective measures described above. What will the court eventually do if Mary dies and the fight finds its way before a judge? That is impossible to say. This is not about guaranteeing a result — it is about guaranteeing a process. The court might give posthumous validation to Mary’s concerns. On the other hand, the court might feel those concerns to have been overblown and give the children to their father. The court will be governed by the best interests of the children. In the end, nothing else counts. Mary is not a real person. Her story takes details from several clients who have been in the same position as Mary and taken some or all of the steps described above in a bid to protect their children.